Before Robert Bringhurst, there was Geoffrey Dowding. 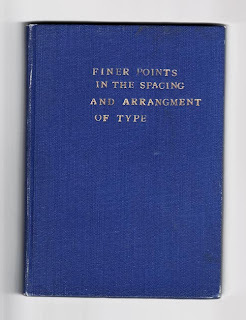 U&lc online magazine recently listed Dowding's notable book, Finer Points in the Spacing and Arrangement of Type as one of the ten essential books on typography for a designer to own. Perhaps the designer of this cover may have benefitted from reading this treasured book.